Prioritization is a top concern for most Product Managers. It’s by far one of the most popular topics on PM blogs, Q&A sites and other online communities. The need to prioritize comes from a very simple fact: we just don’t have enough resources to work on everything we can come up with. 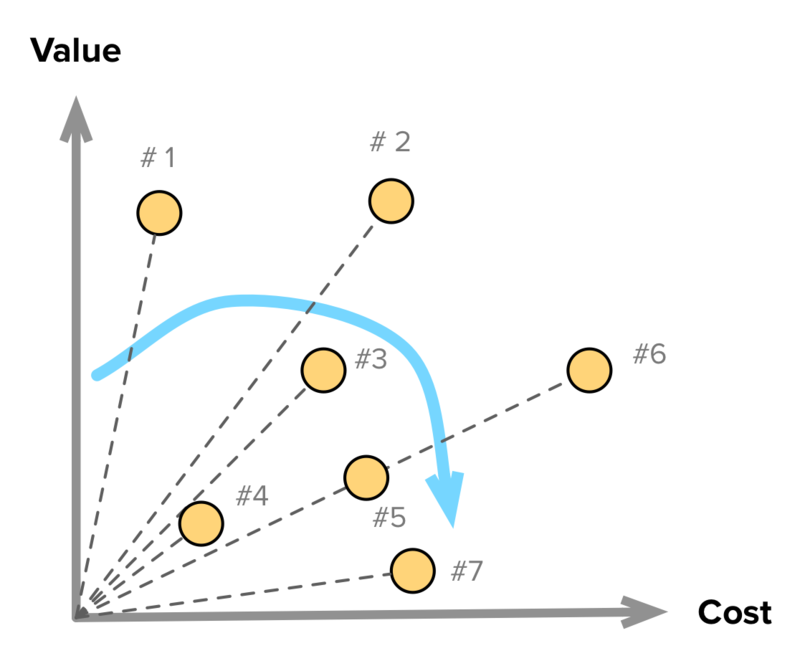 Thus, we need a process to determine the sets (and sequence) of things that should be done on the product to deliver the most value at each point in time, given our constraints. How can we know what’s valuable? How valuable is it? Valuable to whom? How can we define the set of things that should go together in a product release? How should we sequence those releases? How can we get the necessary buy-in to follow through and get these things to the market? How can we know if our assumptions are right? Are we on the right track? Are we really delivering value? Could we do any better? If you search around, you’ll find countless articles with recommendations, techniques and approaches to this very hard problem. However, each method’s usefulness will depend on the specific product or project where it’s applied. Your prioritization needs may vary vastly. 5 commonalities and takeaways from all these methods. When I started working on this guide, I immediately felt the need to visually organize all of these techniques in a way that made sense and showed the context in which each of them is valuable. With this mind, I found two dimensions that fulfilled these requirements and the result was the sort of Periodic Table you see below1. The horizontal axis tracks how oriented a method is towards getting input from the inside or the outside world. In other words, how much it depends on data and opinions from people external to the core product development team. This dimension reflects the fact that sometimes you need involvement from the outside (e.g. 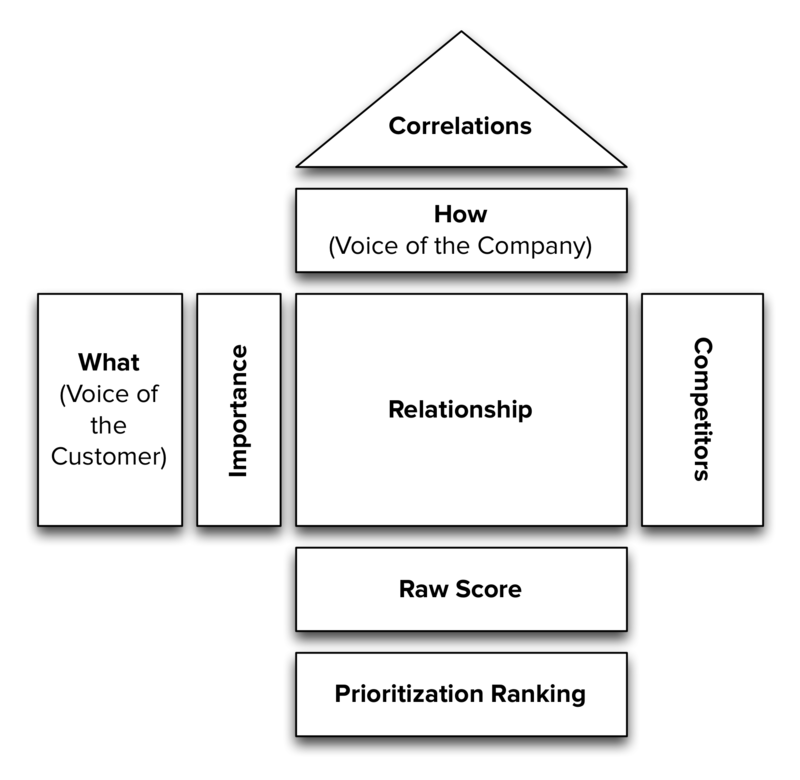 end customers or stakeholders within the company) to help you prioritize. However, in other cases you might want to follow a simpler process with the development team or by yourself. The vertical axis shows how quantitative is the method prescribed by each technique. That is, how much of it is based on expert (personal) opinions instead of some kind of metric, classification, voting or ranking. Some people feel more comfortable around quantitative approaches and being supported by numbers (either for themselves or for people “higher-up”.) In other instances, you need to work on the qualitative side if what you’re trying to achieve is not quantifiable or if it doesn’t make sense in your context. Every technique was placed in the table taking into consideration what I believe to be their relative positions along these two dimensions. Individual locations might be debatable, but I think this is a good starting point to navigate them2. The next section presents an overview of each technique, including pointers to other relevant and in-depth resources. This is an extensive read, so if you don’t have the time right now, get it as a PDF eBook sent to your email. You will also get the Kano package and more Product Management resources. You can determine how customers feel about a feature through a questionnaire. – and another called Investment, Sophistication or Implementation, which represents how much of a given feature the customer gets, how well we’ve implemented it, or how much we’ve invested in its development. Features can fall into four categories, depending on how customers react to the provided level of Functionality. Some product features behave as what we might intuitively think that Satisfaction works: the more we provide, the more satisfied our customers become. Other product features are simply expected by customers. If the product doesn’t have them, it will be considered to be incomplete or just plain bad. This type of features is usually called Must-be or Basic Expectations. There are unexpected features which, when presented, cause a positive reaction. These are usually called Attractive, Exciters or Delighters. Naturally, there are also features towards which we feel indifferent. Those which their presence (or absence) doesn’t make a real difference in our reaction towards the product. The other asks how they feel if they did not have the feature. For each answer-pair, we use this table to determine the category where the respondents falls, letting us know how he or she feels about the feature. Continuous: each functional and dysfunctional answer gets a numerical score, which can then be averaged over all respondents and plotted on a 2D graph. As a general rule of thumb, features should be prioritized such that this order is followed: Must-Be > Performance > Attractive > Indifferent. There are a lot more details that are worth exploring about this method. 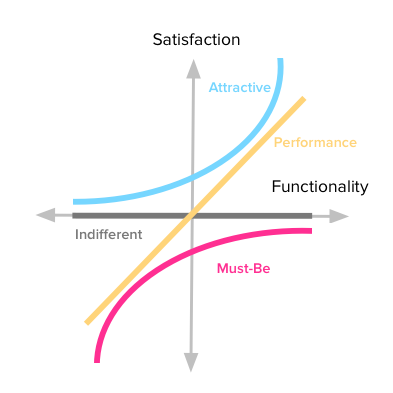 I wrote an extensive, in-depth guide to the Kano model that explains the entire process and gives you a step-by-step guide on how to use it. Quality Function Deployment (QFD) is another method originating in Japan and originally described by Yoji Akao in 1966 for the manufacturing industry. When reading on this subject, there’s a lot of very dry content, but it has an interesting application in our field. QFD has many different dimensions of analysis; we just focus on the What and How. Produce a list of things that are potentially valuable to your users and customers. Do some internal brainstorming, interview current and past customers, survey the competition and any other way to get new task and requirement ideas that you come up with. These are called the “What’s”. It’s now time to know what’s more important to the customers, out of all the other options. Be mindful that simply asking people to tell you what they consider to be most important, usually yields some kind of “everything” response. To avoid this, you can ask them to select the top 5 out of a larger pool of options. Use the percentage of respondents that picked each task as the importance weight factor for the Voice of the Customer. Create a list of concrete features, fixes and enhancements that relate to the tasks that customers want. Items may come the product backlog or may be new ideas resulting from the customers’ feedback. These are called the “How’s”. Priorities come from the highest-impact Features, across all customer requirements. This is obtained by multiplying each requirement’s importance by each feature’s impact. A feature’s score is the sum of these values. The highest priority items will be those with the highest scores. Using this method, there should be enough differences among features to determine which are most important. It will also show if any customer want is not being solved by a how; this is perfectly fine, as long as the want is not an important one. 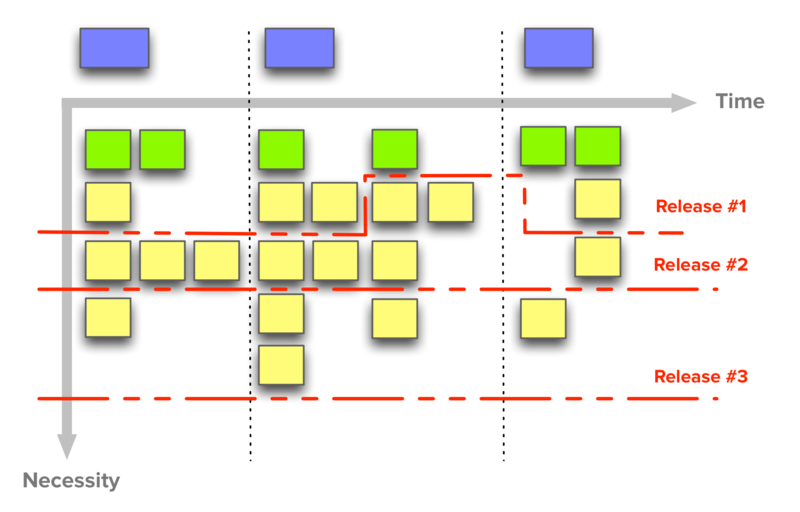 This is how a QFD matrix looks like, following Sauro’s method. I recommend reading the original article and grabbing the handy spreadsheet, to help tabulate everything. This technique comes from Anthony Ulwick’s Outcome-driven Innovation (ODI) framework. The framework builds on the core precept that people buy products and services to get some job done. That is, it’s the expected outcome that matters. Clayton Christensen’s jobs-to-be-done concept shares this line of thinking and it’s been a hot a topic that has gathered a lot of attention lately4. One of the main conclusions from this is that customers are not very good sources of solutions, because they aren’t subject matter experts. However, their input is extremely valuable in understanding the outcomes they want from the product. These results may be plotted on a graph, providing a visual aid to better understand where opportunities reside. Collaboratively — Using a pricing scale that makes some features too expensive for individual buyers to purchase. This forces collaboration and negotiation between players to buy features that are valued by multiple players. This will yield a valuable set of insights on the most important features for customers, as we can analyze which features got bought the most, the reasons for their purchase and which collaborative bids were made on expensive items. To get more data, multiple instances of the game can be played (in groups of 8 people at most.) Also, for large feature-sets, you can set up a championship where popular features are bubbled up through multiple phases of games. Buy a Feature is best played in person due to its collaborative character, but there are online solutions if that’s what you need. Check out this article for a more detailed game explanation and templates for feature cards and play money notes. This method is also very useful for internal or consulting projects that are not exposed to the market, by involving stakeholders as the buyers in the game. It’s a great way to build strategy for the project, consensus on what’s most important, and communicate to stakeholders the notion that features have different development costs5. Story Maps were first introduced by Jeff Patton in this 2005 article and followed-up by another one writing up his more recent experience. Both are excellent reads that I can’t recommend highly enough. The main idea behind Story Maps is that single-list product backlogs are a terrible way to organize and prioritize the work that needs to be done. A richer structure is necessary. Equally important stories can be kept at the same height, but keep in mind that, in general, it’s important to differentiate stories’ relative importance to be able to create better release plans. It very clearly defines how to incrementally release product iterations that deliver complete working releases with increasing sophistication — this is Alistair Cockburn’s concept of the walking skeleton. In my personal opinion, the main drawback for this structure (and the necessary time investment to create and groom it) is that it’s too heavy for projects or products in highly dynamic contexts. That is, when visibility into the future shape of the product is not great (e.g. sub 3 to 6 months), I prefer a different (but related) approach. The MoSCoW method is a prioritization technique used in multiple management fields to reach a consensus on what’s more important to stakeholders and customers. Must have — these are critical and must be included into the product. If even one isn’t included, the release is considered a failure. These can be downgraded if there’s agreement among stakeholders. Should have — these requirements are important but not crucial for the release. They’re the first level of “Nice to have”, and generally share the importance of MUST requirements, without being so time-sensitive. Could have — these requirements are desirable but not necessary for the release. They’re usually low-cost enhancements to the product. Due to their lower importance, they’re the second level of “Nice to have” features. Won’t have — these are considered to be the least-critical or even not aligned with the product strategy. They are to be definitely dropped or to be reconsidered for future releases. This method offers a quick and simple prioritization solution. The problem comes with its lack of grading within categories. For instance, how can we know which SHOULD or COULD requirements are more important than others? Because of this limitation, the MoSCoW method is probably better suited for internal projects instead of products with many customers — talking to a handful of stakeholders about prioritization subtleties will always be easier than a larger scale contact with end customers. Another innovation game from Luke Hohmann. Prune the Product Tree is about shaping the product’s direction towards market needs, but also understanding if some product areas are being left behind. The analogy in the game is that the product is a tree that will be pruned to our liking. Although gardeners do this by cutting parts of the tree, the goal is to shape — it’s not about the cutting. Ask customers and stakeholders to place their desired features on the tree, thus defining its next phase of growth. From here you may extract valuable data points. Is the tree growing in a balanced way? Are specific areas growing disproportionately larger? Are previously under-developed areas growing now? Having a shared view of the entire span of the product with customers can be very insightful when planning new releases. 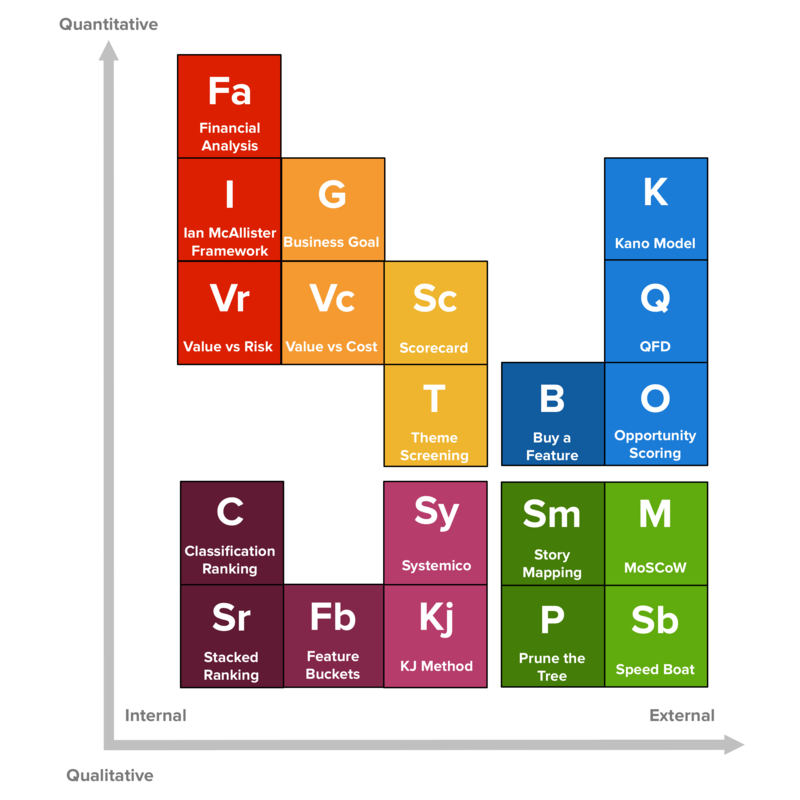 From this visual balance you derive relative value among features, understand which strategic shifts might need to be done and which areas of the product are good candidates for being dropped in the future. One final innovation game in this overview. 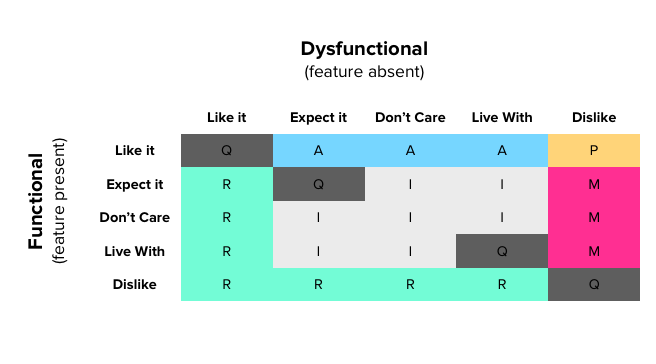 I find this one particularly interesting because it focuses on a different kind of prioritization: identifying which are the least liked features in the product. If you ask people to tell you about their grievances on the product, you may be in for a dose of frustration. Creating a “let it all out” kind of session with customers can generate a large amount of feedback with a lot of noise. Each anchor and speed estimate will give you a measure of “pain” which you can later prioritize for improvement. Hohmann’s insight is that although customers may have complaints, they’re almost never all-out against the product. Most of the time they want to succeed using it, despite their frustration. That’s why creating this gamified outlet is more effective — it sidesteps the groupthink that may arise in a “share your complaints” session, and frees people to express their opinion with less bias. Product initiatives and projects are often undertaken with a specific goal of increasing revenues or reducing costs. Also, many organizations require a business case for new product features. For these and similar situations, it’s necessary to do a financial analysis of candidate development themes6. Those with the best financial outcomes are then prioritized. We’ll explore common metrics for evaluating financial returns, but I suggest reading more on the subject if you’re interested in this kind of analysis and prioritization, as it gets complex pretty rapidly. Mike Cohn’s excellent book, Agile Estimating and Planning, dedicates an entire chapter to this topic. These goals can be estimated over a given timespan for each theme we’re trying to prioritize, giving us the total projected revenue they will generate. “How much of today’s money will we have after X amount of time, if we invest in this project? For a 5% interest rate, we’d need to put $9.52 in the bank today to have $10 in a year. Moving future amounts to their present value is called discounting. When evaluating alternative projects in which to invest, companies consider an Opportunity Cost in place of an interest rate. It represents what’s not earned as a consequence of investing in something else. 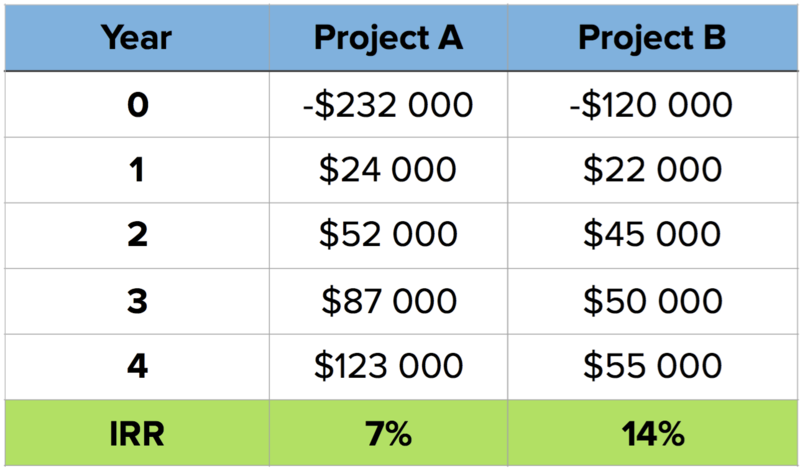 If a company usually gets a 15% return on its projects, then that’s the opportunity cost against which an alternative project should be compared to. Internal Rate of Return is a measure that expresses the return on a project in percentage terms. In other words, it shows how quickly an investment will increase in value. IRR is defined as the interest rate at which the NPV is equal to zero. It’s hard to calculate manually, but spreadsheet apps come with this formula, making it trivial to get to — you just need to input the necessary investments and cash flows over time. From this value, you get a project’s return and can compare it to others. 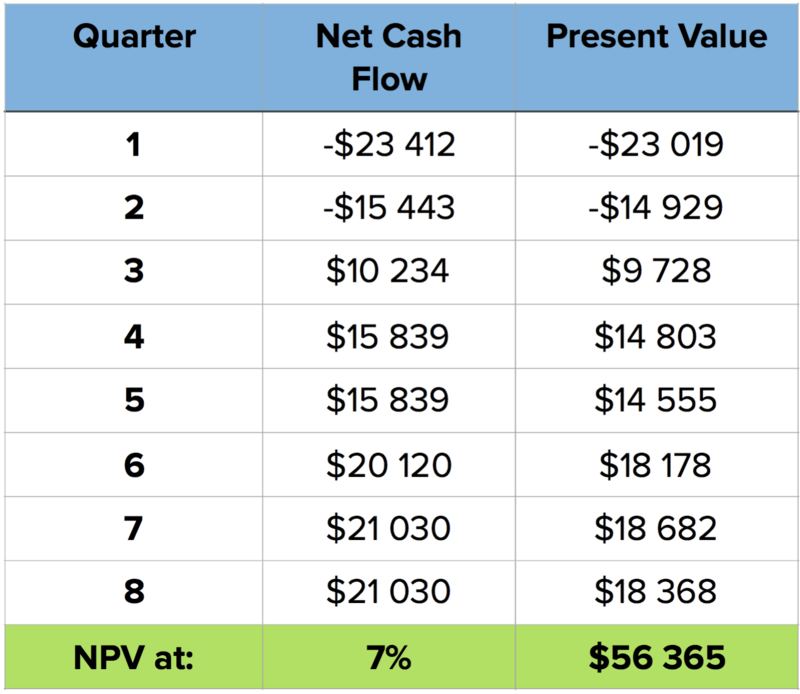 However, this shouldn’t be taken in isolation to make decisions, as the overall NPV or the investment time it takes may be important decision factors. The final factor to take into account is how long it will take to get back the investment. 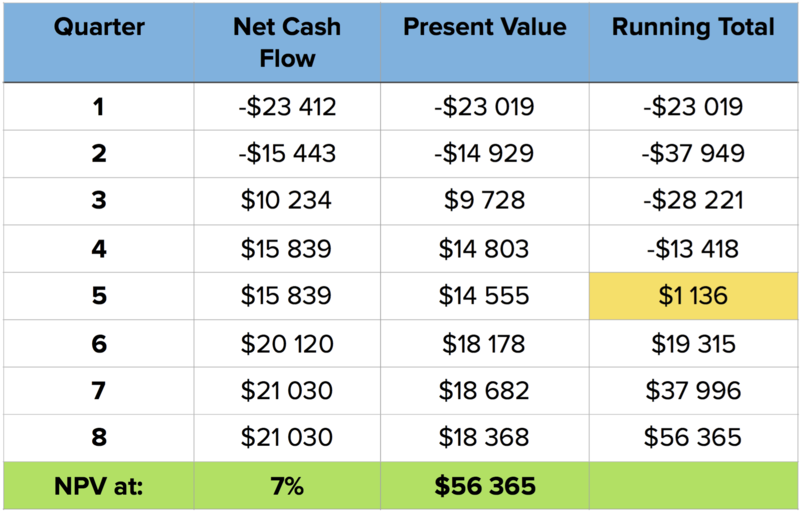 For this, we look at the running total of the sum of discounted cash flows. When it turns positive, it means the investment has been recovered. What this number doesn’t tell us is how much money will be made. However, it is useful to measure the level of risk associated with a project. The longer it takes to make the money back, the riskier it is. Depending on the company’s financial conditions and risk tolerance, this can be a critical factor. Create a list of the most important themes (e.g. customer acquisition, engagement, activation, ARPU) and select the top three. Use projects ideas you already have for each theme and come up with new ones. Keep in mind the Pareto principleand focus on the 20% of the project that will get you to 80% of the desired outcome. With your team’s (and relevant stakeholder’s) help, come up with an estimation for each project’s costs. Set priorities considering the projects with the best impact-to-cost ratios. You should check out Ian’s original answer for more details and to read about the multiple benefits he finds in this framework. Out of those, the one that jumps out to me as the most useful is to resource themes independently. That is: pick the important themes and assign team members and other resources beforehand. This sets you free from constantly struggling to prioritize very different themes that you may be developing in parallel. Referral: users like product enough to recommend to others. These stages are a funnel through which (potential) customers advance. The goal is to broaden the funnel as much as possible between stages. which business goal are we trying to improve at this moment? Depending on the kind of metric or goal you’re targeting, it’s probably best to focus on testing and optimizing just one at a time. This makes it easier to measure the results of what was done and use that to decide what to do next: move on to another metric or keep improving the same one. 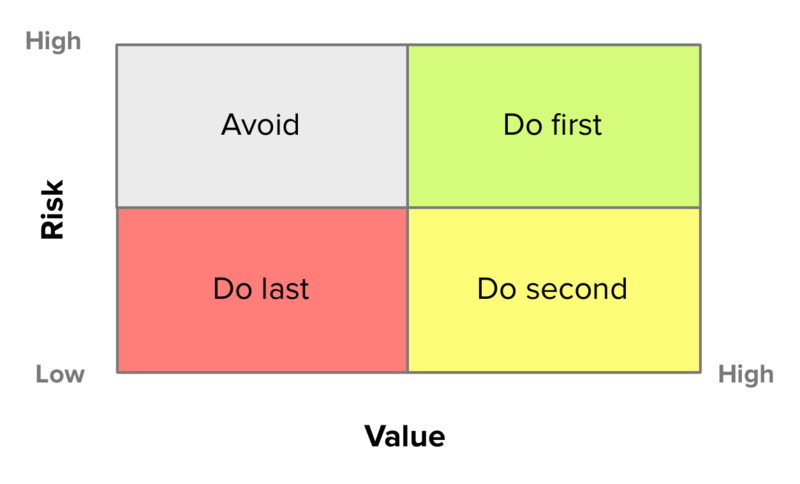 Specially for early-stage products, this kind of framework brings a single-minded, quantitative and business-aligned focus to prioritization, which can be very helpful. However, Mike Cohn also talks about considering Risk as a prioritization factor in his book, which I’ve found to be an extremely valuable approach for new products and initiatives. There’s a constant struggle between high-risk and high-value. What should be done first? On one hand, if you avoid risky items and go for high-value first, you might develop a large part of the product before hitting a major roadblock. On the other, if you focus on working on high-risk items first, you might end up doing unnecessary work on features that turned out to be less valuable. The goal is to look for a balanced approach, going for High-risk/High-value first, Low-risk/High-value second and finally Low-risk/Low-value. High-risk/Low-value items are best avoided. This is a very common prioritization technique with the advantage of also being very simple. Features are scored on their Value and Cost of implementation. Those with the best ratios will have higher priority. Be mindful that “Cost” doesn’t need to mean actual currency units (i.e. “money”). There are many cost functions that may be much more readily available or easier to calculate. An extremely common such function is the notion of engineering effort or complexity, which is why this method is also often called “Value vs. Effort” or “Value vs. Complexity”. Also called Bang for the buck, the inherent ROI-like analysis in this method feels intuitive and is also embedded within other prioritization techniques. The main goal with this method is that we try to maximize value delivery over time. That is, for a given release timeframe, we work on the most valuable items we can fit in the period. One way to visualize this technique, is through a graph. Scatter plot all features being considered, with regards to their score in each dimension. Then, prioritization rankings will be visible as the slopes of the lines going from the origin to each feature. The higher the slope, the higher the priority. As usual, just carefully consider what comes out of prioritization methods and use them as guidelines and not definitive answers. Go over all candidate features/themes and assign a score (e.g. from 1 to 100) on their respective impact for each criterion. Another way to allow full use of the point scale is to identify a feature/theme that is considered to be in the middle of it for each criterion. Then, score all other features in comparison to that one; a shorter scale (from 1 to 5) will work best in this approach. The scorecard can be a useful exercise for companies to evaluate what they believe is the relative impact on strategic objectives for a group of possible new features. Are weights and scores “cooked” to prioritize features already favored by opinion and politics, while at the same time give the appearance of objective analysis? It can lead to fragmented products, unfocused from their Unique Value Proposition. For each feature/theme and scoring criterion, calculate its Net Score and rank features by this value. Perhaps by having a bit less confirmation bias (in the form of criteria weights and scoring scales), this method can sidestep some of the drawbacks of scorecards. Also, if considering a single category for ranking, this can be the scoring tool for other prioritization methods that focus on features’ impact on a given business metric or the product’s Unique Value Proposition. This kind of ranking is one of the most straightforward (and naive) that we can use. It is however useful for very small and internal projects. The process is simple: each feature is classified into some category, and then a ranking is produced. Categories must be sortable in some way, e.g. 1-2-3-4-5, High-Medium-Low. It’s related to MoSCoW, but as it’s typically based on personal (“expert”) opinions, I’ve classified it on the Internal side of methods. You can use it with other stakeholders but the ambiguity of categorization will almost certainly lead to trouble. Better keep it to yourself if you use it at all. Product requirements are made visible in terms of how they address user goals and engagement levels. 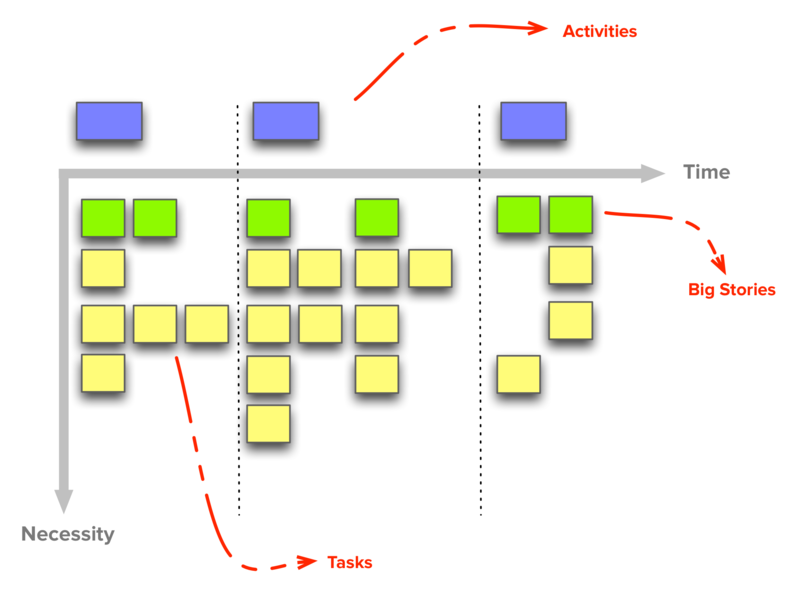 This model is related to Story Mapping, as it also creates a two-dimensional grid that makes it easy to visualize the scope of the product and the different priority levels. User Goals — The first dimension is User Goals. The product is defined not in terms of What it does but in terms Why some functionality is necessary. Explore: Features that build a stronger connection between the user and the product as they promote going beyond simple interactions. 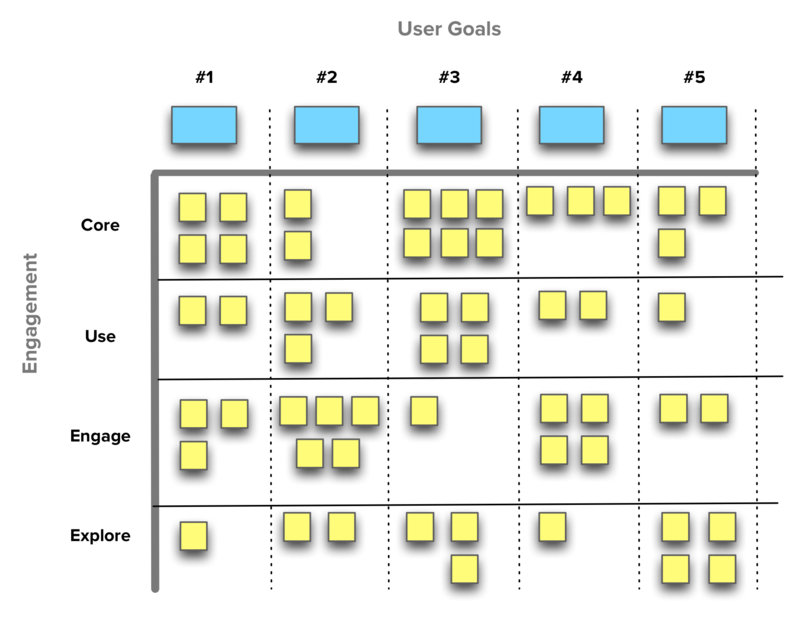 User Stories are then placed within the corresponding User Goal and Engagement levels. As User Stories themselves may carry additional value and cost attributes, this model turns into an easy to explore multi-dimensional system. 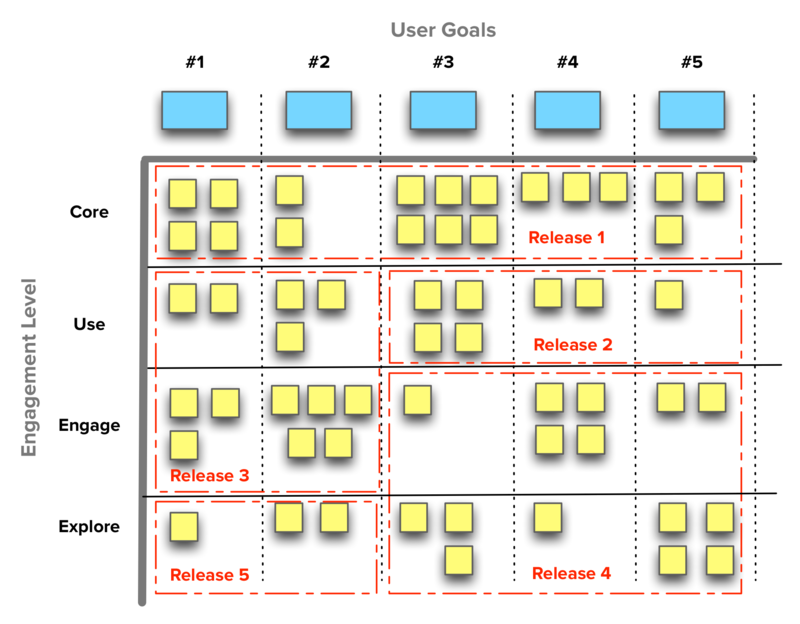 Just as in Story Mapping, it’s possible to create a release plan that creates increasing value for the customer, and at the same time gather feedback before investing heavily on a given feature set. The kind of Value Maps that the Systemico Model and Story Mapping create are incredibly useful. They let us visualize different impact levels that features may have on some user goal or activity, leading to easier release planning. If these approaches show Impact across Product Areas, the Intercom team proposes a prioritization scheme based on Impact on User Base. That is, focusing on what’s used the most by a majority of the product’s user base. The typical backlog is a flat list of items. This guide covers many techniques on how to organize it differently and how to prioritize it. Most of them will produce a stacked-ranked list of themes or features to develop. However in many instances (probably the majority), this stacked-ranking is based upon a Product Manager’s own “expert” opinion. In other cases, this list is based on conversations and talks with stakeholders. This kind of prioritization in not inherently wrong; it’s just not right for user-focused value creation. Due to its widespread usage, it deserves a mention in this guide but its position in the table aims to reflect that this as opinion-based and internally-focused as it gets. The Feature Buckets12 technique by Adam Nash is also very popular on Quora. Adam believes that feature prioritization varies a lot across different product types and industries and that’s why he emphasizes that this technique was thought specifically for consumer internet products. A well balanced product release should typically include features from all of these buckets. The framework is not explicit as to the appropriate distributions among these buckets and to how to prioritize internally within each. These implementation details are left up to the Product Manager to define. One final Japanese technique in this overview. The KJ Method is a technique devised by Jiro Kawakita as a group process to establish priorities13. It quickly produces “objective group consensus out of a collection of subjective, opinionated data.” It’s on the Internal side of techniques as the way its usage is described is mostly targeted at stakeholders within the same organization. Whiteboard or flip-chart for the final ranking step. Organize the GroupPeople in the group should be from different parts of the organization, to get more diverse perspectives. Put Opinions (or Data) onto Sticky NotesPutting one item on each sticky note, each group participant is asked to brainstorm as many items as they can think of. Put Sticky Notes on the WallEach participant puts their sticky notes up on the wall in random order. They also read other people’s contributions. If they think of something else that should go on the wall, at any time, they can just add it to the collection. Group Similar ItemsOnce everyone has added their contributions to the wall, the facilitator instructs the group to start grouping similar items in another part of the room. Naming Each GroupEach participant is asked to assign a name to every group, using the second color of sticky notes. Voting for the Most Important GroupsParticipants are asked to individually use their own viewpoint to choose which groups he or she believes are most important to answering the focus question. Ranking the Most Important GroupsThis is the final and most important step. All individual sticky notes are placed on the whiteboard and ordered by number of votes. Participants can combine similar groups, which adds their votes and moves them up the ranking. When three to four groups have much higher ranking than the rest, the facilitator may stop the exercise. Because of the combination of free individual opinion through voting and the enforced unanimous consensus in the final step, this method can quickly converge to a group buy-in of priorities. This helps any teams that depend upon stakeholders’ participation and agreement on the product strategy and priorities. After going through all of these techniques you will have probably noticed that they each have contexts in which they make sense to be used and others when they don’t. As much as we’d like to, there are no prioritization silver bullets and we have to choose whatever is more appropriate for our product, team, industry, etc. At the same time, there are important commonalities among these methods that are worth pointing out. Let’s go over the most important takeaways from this fascinating task we call Prioritizing. After working out the strategy and high-level priorities, the team should take care of finding the best tactics to get there. The objective is not to set priorities and ship them. The objective is to constantly be aware if what we’re doing is really adding value and working out as expected; when it’s not, we will at least have some clues as to what needs adjustment. Prioritization should not be a solo effort. With the exception of very simple methods, almost all of them involve someone else in the process. Be they customers, stakeholders or team members, it’s very rare that the Product Manager alone will set the overall priorities. We’re just in charge of a process and the product belongs to the team. Getting the most external input we can gets us buy-in and confidence that what gets prioritized is effectively valuable. And even then, we’re only sure after measuring the actual results. Quantitative does not mean better than qualitative (and vice-versa.). For instance, a common pitfall when using quantitative prioritization methods is that people associate numbers with precision and confidence. Seeing formulas, ratios and rankings usually makes us feel more assured as to the robustness and objectivity of some type of analysis, but these can be gamed. You should keep this in mind both for yourself and when presenting results to other people — these things are guidelines and not infallible outcomes. Know what you’re getting out of the method and when to use it. These things are tools, not oracles. The External and Internal distinction that we’ve used in this guide relates to how much external involvement there is in the prioritization process. 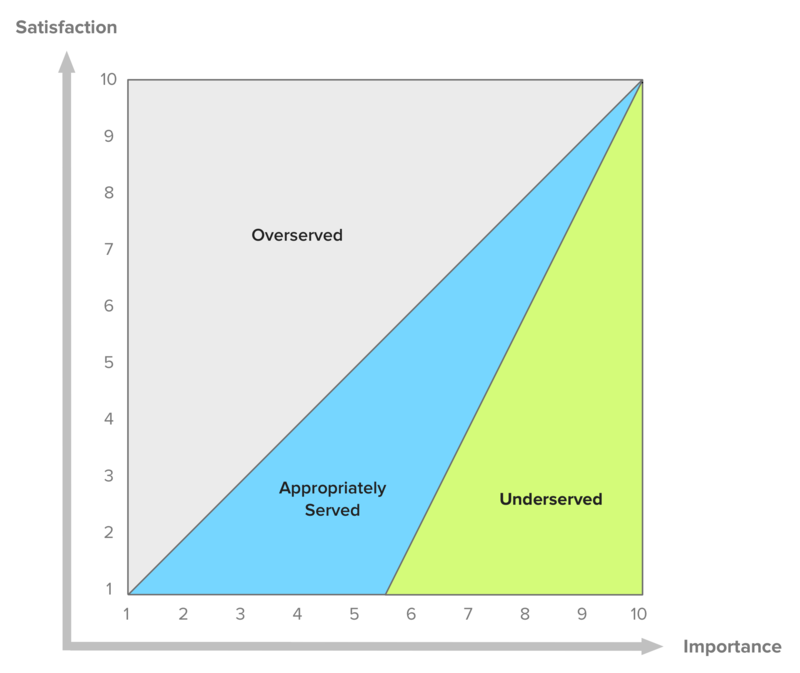 The scale goes something like this: You < Team < Stakeholders < Customers. Internal techniques are better for prioritizing concrete solutions. Getting clients in consulting projects to participate and sign-off on the development strategy and release plan. Since you’re dealing mostly with “the outside world” is only natural that discussions and prioritization here happen at a more abstract level of user outcomes, goals and high-level features. Quickly prioritize low level features and requirements. With all of these techniques and takeaways in hand, it’s now up to you. Mix and match them. Make changes. But above all, go out and build great products. If you’ve made it this far and found this guide helpful, it would be great if you could share it with friends and colleagues that you think might also appreciate it. Also, if you have any comments or questions, just get in touch. You will also get actionable, useful content and resources on Product Management. Delivered straight to your inbox.